Of all the things you'd expect to find at the bottom of the ocean, a small village of old New York subway cars may not cross your mind. 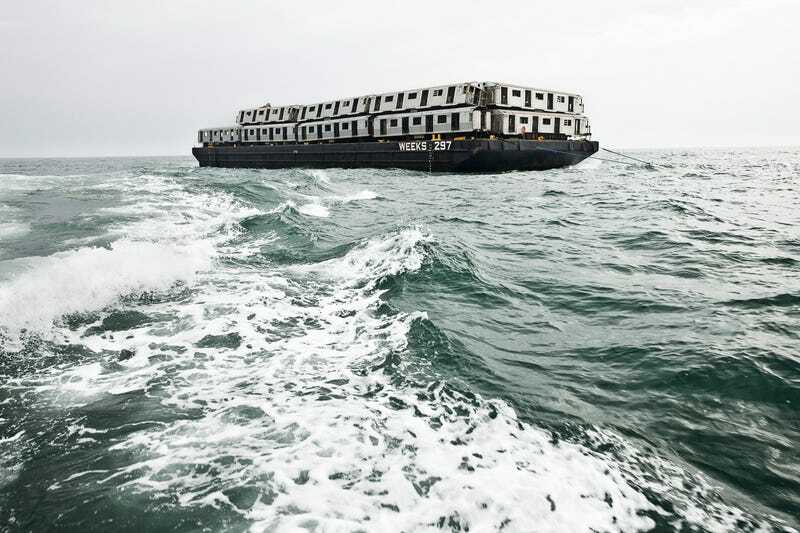 But for over a decade, subway cars have been discarded into the Atlantic in an environmental effort to create artificial reef habitats for fostering sea life. Photographer Stephen Mallon was lucky enough to witness and document the spectacle over a three year period. His series, Next Stop, Atlantic, is sure to surprise viewers, especially New Yorkers whose beloved (despised?) subway cars are so instantly recognizable. Taken out of their usual context of dark, dank underground tunnels, the cars are visually arresting when seen stacked upon a barge and dumped into the ocean like stones. The first thing most people think when seeing Mallon's photos is that this is an act of pollution. But the ongoing effort is quite the opposite. The stripped metal frames of the cars serve as breeding grounds for marine organisms that attach themselves to hard surfaces. The newly spawned life creates food for other sea dwelling animals, fostering a healthier habitat overall. It is a remarkable irony, and one that puts your brain in knots while look at these hulking pieces of man-made garbage careening into the ocean. And of course, they are captured by Mallon beautifully, with the weight of the steel cars and churning of the sea really coming across. Mallon's images are still being exhibited years after the series was completed. Currently they are a part of the exhibition Patterns of Interest at NYU's Kimmel Galleries on view from February 6th through March 15th. You can also check out more of Mallon's incredible work on his website.